You heard. The final line-up for this year’s mini Swn (or DimSwn – which means ‘No Swn’ for the Welsh learners in the crowd)(actually technically it means No Sound, but anyway) has been announced, and is below. 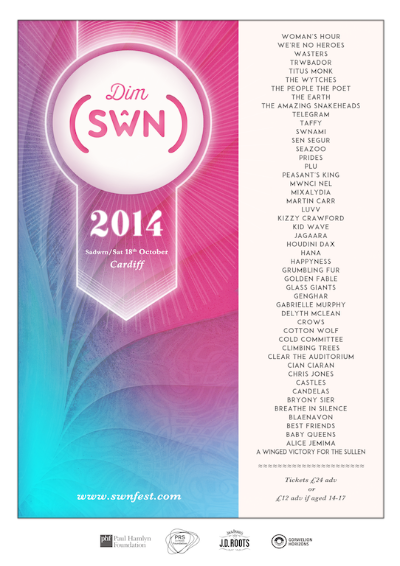 Horizons / Gorwelion will be showcasing their 12 bands at DimSwn this year. Horizons is a scheme delivered by BBC Cymru Wales in partnership with Arts Council Wales to develop new, independent contemporary music in Wales. Its aim is to support and promote emerging Welsh music talent to new and wider audiences. Horizons / Gorwelion artists performing at DimSwn are: Baby Queens, Candelas,Chris Jones, Climbing Trees, Gabrielle Murphy, Houdini Dax, Kizzy Crawford,Plu, Seazoo, Swnami, The People The Poet.